An electricity generator invited bids for development of a coal resource, offering a long-term coal supply agreement. A joint venture consortium was considering whether or not to proceed to a full evaluation and a commercial bid. Preparing a competitive commercial bid would have required a significant investment of time and resources by the consortium partners. They wanted to examine the issues surrounding the mine development and its commercial implications before they committed to preparing a full bid. A risk management process was used for the assessment, with very minor variations on the standard approach to accommodate the consortium companies' desire to focus on what they wanted to call ‘issues’ rather than risks. In practice, this was just a change of wording. The risk management approach was preferred due to the uncertainty associated with many of the key aspects of the decision. After much discussion, the JV decided it would not proceed to a full bid. The structured assessment provided a framework for analysis, discussion and decision-making. It helped senior personnel from different companies, with different perspectives and objectives, to develop a common understanding and approach, and to reach an agreed decision not to bid relatively efficiently. Without the facilitated analysis, the JV companies would have taken far longer to reach a decision and might have overlooked or misjudged important aspects of the decision. 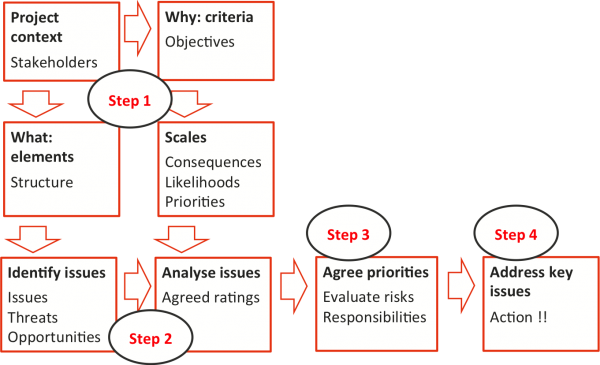 Structured analysis of risks provides a framework for developing a shared understanding and a set of agreed outcomes. Many of the benefits are obtained while establishing the context, the preparatory stage of the ISO 31000 process. The remainder of the process flows relatively smoothly once the context has been agreed. An electricity generator, the operator of a large coal-fired power station, held rights to a known thermal coal resource. The designated resource was in a coal province and not far from infrastructure, including heavy rail already used for coal haulage. The generator wanted to develop the resource to provide long-term supply to the power station, with any additional coal produced being available to a potential developer for sale to other markets. The generator issued an information memorandum and a draft coal supply agreement, inviting companies to tender for the rights to develop a new mine, supply the power station and sell the surplus coal. It indicated that a bid conforming to all the draft conditions was required. A joint venture consortium was formed to examine the proposed development and, if appropriate, prepare and submit a competitive bid. The JV consisted of three large companies with expertise in mine development and management, contract mining and coal marketing. Before they committed themselves, and large amounts of money, the JV partners wanted to identify and examine the issues associated with bidding for the development. They asked Broadleaf to run a workshop to help them to identify important issues, to agree priorities for the issues and to assign responsibilities for addressing the most critical of them. The intention was to identify any 'deal breakers' at an early stage and to make a decision about whether or not to invest the effort necessary for a full commercial and technical appraisal of the merits of a bid. Step 3 confirmed and agreed priorities for the issues and assigned responsibilities for dealing with the high-priority ones -Step 4, taking action to address the high-priority issues, was a later task for the JV participants. Allocated responsibilities for managing the issues. The elements used to break the overall assessment into parts and to structure the workshop are shown in Table 1. The focus was on the high-level issues in each area – technical detail was included only as far as appropriate at this point in the appraisal of the decision to bid. The most important consequence criteria at this stage of the project are summarised in Table 2. Within each category five levels of severity were defined, against which each issue was rated (Table 3). Note that some important criteria like safety were omitted as not relevant at this stage of the bid appraisal. For example, safety would be critical in the delivery of the project once a decision had been made to proceed with the mine development, but for the purpose of this workshop it was either a financial matter associated with design requirements to make the mine safe or a tactical matter that would be addressed by standard working practices. In contrast, environmental concerns had major strategic and commercial implications for which treatment requirements were not clear at the time of the analysis. Financial loss includes capital and revenue losses and additional operating expenses, as well as lost opportunities to add economic value, or their NPV equivalents. Reputation and image in its widest sense, including reputation in the market, ability to form joint ventures and commercial alliances in the future, credit or insurance effects and loss of shareholder or community support. Environment covers inappropriate releases of material and breaches of relevant regulations. Each potential (credible) outcome was assessed against each consequence category using Table 3. When assessing the consequences of a specific issue, the most severe consequence over all the scales in the priority calculation was used. Financial loss that would severely burden the company, or loss of outstanding opportunity. Adverse long term impact on reputation or image (over 10 years). Active positions taken against the company. Adverse long-term impact on credit or insurance profile. Major loss of shareholder or community support. Long-term environmental harm (20 years or more). A permanent ecological damage that endangers ecological processes or poses significant harm to people. Major financial loss, or loss of major opportunity. Adverse medium term impact on reputation or image (1 to 10 years). Active positions taken against the company by a limited group of stakeholders. Adverse short-term impact on credit or insurance profile. Significant decrease in shareholder or community support. Significant ecological damage that is controllable but impacts may last up to 20 years. Violation of regulations or breach of limits specified in approvals. Moderate financial loss, or loss of moderate opportunity. Adverse short term impact on reputation or image (up to 1 year). Active positions taken against the company by an isolated group of stakeholders. No impact on credit or insurance profile. Decrease in shareholder or community support. Moderate uncontained release or violation of regulation or guideline with moderate damage to the environment and significant clean-up cost. Financial loss that is managed by Executive and can be absorbed within group operating budgets, or loss of minor opportunity. Small adverse impact on reputation that is contained to small number of stakeholders. Concerns on performance raised by shareholders or the community. Small uncontained release or violation of regulation or guideline with minimal damage to the environment and small clean up (reportable incident). Financial loss that can be absorbed within line manager budgets. No impact on reputation or image. Public awareness may exist, but there is no public concern. Small release that is contained on-site and is non-reportable. The likelihood rating refers to the potential for issues to occur and lead to the assessed level of consequences. It was described using a five-point scale. Consequences and likelihoods were then combined into an initial high, medium and low measure of priority using a simple table. In the second pass, the initial priorities were reviewed, priorities were agreed and responsibilities were allocated. 56 issues were identified initially. There was some overlap, and the set was reduced to 51, summarised in Table 4. The 16 high-priority issues required action and the direct attention of senior management. Responsibility for leading the resolution of each issue was agreed in the workshop. It was recognised that most issues would require input and effort from all participants – the intention was to indicate who should be taking the lead in ensuring that an appropriate resolution was agreed. 2.01 related to the bid strategy, balancing the JV’s need for contract terms and conditions that protected its position until it had adequate information against the generator's desire for an unconditional offer. 3.03 concerned the relationships between the JV participants, particularly in the delivery and operations phases. 5.03 related to the JV’s response to competition. This was more likely to become a practical concern during project operations, but the sensitivity of returns to competitive pressures should be tested in the financial model. Issue 2.08 is a detailed negotiating matter, to be resolved by the Negotiation Manager when appointed. If we intend to add significant conditions to our bid response, it will be difficult to submit a conforming bid as required. We need to agree a structure for our bid, and the form of conditions to apply. The bid will have to be very diplomatically worded to get across the line. It may be possible to submit a conforming (but unattractive) bid coupled with an attractive non-conforming offer, or to impose general conditions ('subject to Board approval') to make the bid look relatively unconditional. The bid evaluation and negotiation periods are very tight. Delays by the generator may impose restrictions on the activities necessary for obtaining the Mining Lease and securing financing. In addition, the Government may repudiate or delay the implementation of an agreement negotiated by the generator. We are at risk for bid costs until contract award. If there were a delay in contract award, we would expect to negotiate a similar delay in the termination date relating to obtaining the Mining Lease. Mechanisms for establishing and managing related party contracts must be clarified. Other coal projects come on stream and under-cut our prices. The effects of competition depend on where we are on the cost curve, but many factors are favourable to us. We expect competition from China and other international suppliers. There were four high-priority issues where the coal marketing company should take the lead in developing responses (Table 6). Three of these issues (1.02, 5.02 and 5.04) related to the coal market and the management of contracts and prices. 8.09 would be resolved as part of activities associated with acquiring the Mining Lease. The long-term cost of coal may be the dominant consideration for the generator if it is to remain competitive in the electricity market. However, nobody may be able to provide coal cheaply enough to improve its competitive position. Are we prepared to cross subsidise coal for the generator with export coal and to what extent? The best offer may be greater than current new entrants elsewhere but still acceptable to the generator. Innovation will be required to succeed. Export contracts are difficult to obtain and negotiate at an acceptable price for thermal coal. We would like off-take agreements for export coal at an early stage. This would probably require a trial pit during the lease approval period to allow testing. We will need to test the effects of price, quality and ramp-up in the financial model. Foreign exchange and price volatility is difficult to manage. Stakeholder objections to the impacts of the mine development delay the award of the Mining Lease and increase costs. Three issues (2.03, 3.01 and 5.05) had important links to the financial and risk model for the project. They would all require extensive discussion with the other JV participants. 2.16 related to the tax treatment of the contract. A ruling from the tax authority may be needed on this, and there may also be implications for the financial model. The remaining issues (6.01, 6.02, 6.03 and 7.06) were technical matters to be resolved as part of the initial development planning. They would also have financial implications to be included in the model. The price escalation formula for coal is not commercial for the generator over a long-term contract like the coal supply agreement. This is an opportunity rather than a threat. We do not yet have a common agreed risk profile for the whole project. A suitable quantitative risk model is available and is being tailored for this project. This will provide the basis for a common view of risks. Product specification and product mix: we can't get the revenue we need due to a mismatch between what we can provide and what the market wants. The issue is that product specification is not suited to export market requirements. We will need the ability to control the plant for flexibility of production as the nature of the resource changes and market requirements change. Tax: does the reversion of the asset to the generator at the end of the contract period deny deductions for the JV under taxation legislation? This must be reviewed. A specific ruling may be needed to provide certainty. Geological and mining risks (inability to maintain coal supply) are difficult to cover, largely due to the long time frame for the coal supply agreement. Adverse geological conditions make coal extraction far more difficult and costly than expected. Coal resources prove to be far less than anticipated, or of far lower quality, and it is difficult to meet our contract obligations. Note that we have made more conservative ('more realistic') assumptions about the reserve than the generator in its information memorandum. Insufficient water supply available for the mine. The outcomes noted above provided a structure for the next stage of analysis and decision making by the JV partners following the workshop. More detailed reviews indicated that most of the mining and associated technical matters could be resolved, or were likely to be acceptable to the coal miner given its operating experience in the region. However, informal discussions with the generator and export market studies indicated there were major commercial threats that could not be mitigated easily. They were driven by the long-term nature of the supply agreement, the availability of export markets and the ability to supply coal of an appropriate quality to meet market requirements over that long period, and the apparent reluctance of the generator to countenance a conditional bid in any form. After much discussion, the JV decided it would not proceed further to a full bid, and it withdrew from the process. The structured analysis of the issues associated with the bid was credited with providing an agreed framework for analysis, discussion and decision-making. It helped senior personnel from different companies, with different perspectives and objectives, to develop a common understanding and a common approach to commercial objectives and priorities, and to reach an agreed decision relatively efficiently. They saved a significant amount of financial and management resources that would otherwise have been expended developing a full bid, which would probably have led them to withdraw anyway once they developed a detailed understanding of the prospect. Structured analysis of risks provides a framework within which people from different organisations and perspectives can work towards a shared understanding of each other's points of view and a set of agreed outcomes. Many important benefits are obtained while establishing the context, which sets the structure for the rest of the analysis. Once the context has been agreed, the risk assessment process itself flows relatively smoothly to highlight the major areas of concern and priorities for action.